Barack Obama and Mitt Romney Debate: Who can set expectations lowest for the first presidential debate? Photograph by Jewel Samad/AFP/Getty Images. “Mitt Romney, in his experience in business, is extremely well-prepared for the process of fielding ideas on the fly and, you know, responding to them off the cuff. Whereas the President has, for the last four years, he’s been—you know, sometimes the only voice in the room, and I don’t know that he’s faced an adversary as strong as Romney during daily briefings.”—Obama campaign spokesperson Jen Psaki, Oct. 1, 6:45 p.m.
“President Obama inspired a nation just four years ago. You think he’s lost that magic? Hell no. 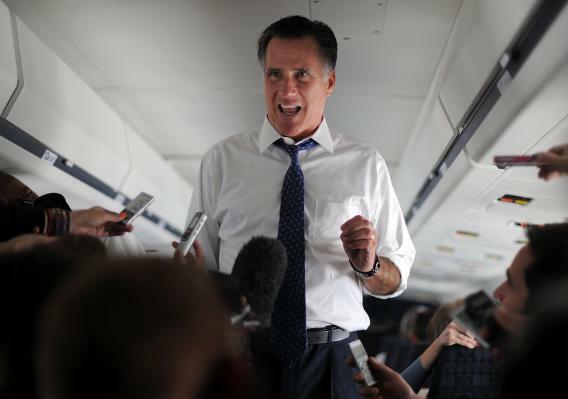 Mitt doesn’t have that kind of charisma, he just doesn’t.”—Unnamed Romney consultant, Oct. 1, 8:51 p.m.
“Mitt Romney is one of our generation’s greatest orators. He has an uncanny knack for presenting his policies in a completely concise and straightforward manner. On the other hand, I tend to ramble a bit. I never give a 30-second answer where a two-minute answer will do, and I never give a two-minute answer where a 5-minute lecture will do. I often don’t focus on the issue at hand, preferring to dwell on the big picture, a real detriment in a debate-type environment, where people are looking to you for sharp delineations in policy—maybe because Americans as a people have been trained by years of sound bites to mistrust complexity. It’s interesting to consider. Because my extemporaneous style of speaking is heavily dependent on digressions—that is, moments when, not unlike former president George H.W. Bush, an underrated leader if ever there was one, who helped usher America from the Cold War to the modern era.”—Barack Obama, Oct. 2, 8:45 a.m.
“I’ve barely prepared for this debate. Gonna wing it! Ha ha!”—Mitt Romney, Oct. 2, 11:20 a.m.
“I love Barack, but he really tends to freeze up when a lot of people are watching him. He’s shy.”—Michelle Obama, Oct. 2, 2:15 p.m.
“Mr. Romney has many talents, but debating under the hot lights of TV isn’t one of them. It’s not widely known that he lacks sweat glands, and so can only dissipate heat from his body by panting, like a dog. Needless to say, this is a manageable condition under most circumstances, but aides disclosed that the campaign should have done a better job preparing the nation for the sight of the Republican candidate for president standing at the podium, his long tongue lolling like a basset hound’s.”—Ramesh Ponnuru, “Privately, Romney Campaign Worries About Onstage Panting,” National Review online, posted Oct. 2, 9:18 p.m.
“This morning the president played basketball for three hours, then drank about a quart of Scotch. He just really threw it back. Right now he is wandering the West Wing pantsing all the Joint Chiefs he can find. 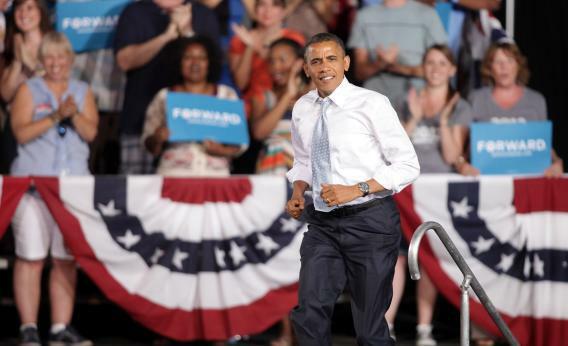 We hope he’ll be ready for the debate tonight, but who knows.”—White House Press Secretary Jay Carney, Oct. 3, 10:15 a.m. Photograph by John Gurzinski/Getty Images. “Look, English isn’t even my native language. President Obama is going to—¿cómo se dice?—wipe me all over the floor?”—Mitt Romney, Oct. 3, 11:20 a.m.
“If I can get up there and not literally soil myself, honestly, that’s a victory as far as I’m concerned.”—Barack Obama, Oct. 3, 1:45 p.m.
“Who knows what’ll happen! Maybe I’ll just get up there on the podium and start talking about a wonderful man named Joseph Smith!”—Mitt Romney, Oct. 3, 3 p.m.
“Yeah, I know I have a debate tonight, but that movie Looper sounds awesome. It’s at Gallery Place at 9:10. I got tickets online just in case. Might do that instead. It’s gonna be a game-time decision.”—Barack Obama, Oct. 3, 4:28 p.m.
“Mr. Romney told me he’ll probably be crying somewhere because of how Barack Obama is better at debating than him.”—Romney afternoon press briefing with spokesperson Andrea Saul, Oct. 3, 4:50 p.m.
“Hello, I’m Jim Lehrer and welcome to the first presidential debate of the 2012 campaign. Unfortunately, neither candidate is here. In place of Barack Obama, the Democratic National Committee has sent comedian Elayne Boosler. Meanwhile, at Governor Romney’s podium, there is in fact a large honey-baked ham. We’ll see you on October 11 for the second debate, which will focus on foreign and domestic policy. Good night.”—Jim Lehrer, Oct. 3, 9:04 p.m.